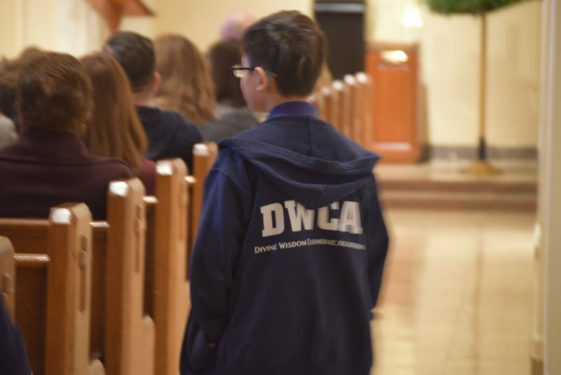 Nearly eight years after establishing itself as Divine Wisdom Catholic Academy, the school celebrated the opening of its new 4,000 square foot building with a Mass and special blessing Dec. 3 at the parish that shares its historical roots, St. Anastasia, Douglaston. 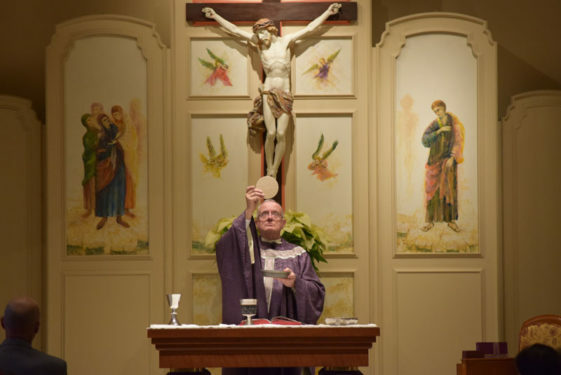 During his homily, he told the SRO church that the school’s expansion wouldn’t have been possible without the support from the school and parish communities combined. Msgr. Anthony Sherman and Divine Wisdom faculty lead prayers with the community. Principal Miriam Bonici (center) started her journey with the school first as a parent, then teacher and now principal. 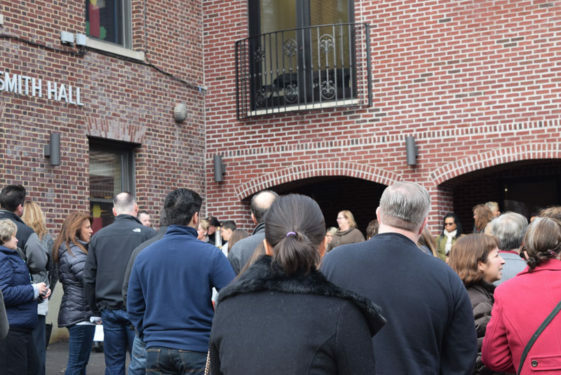 Immediately following Mass, those gathered around the altar were also invited to gather outside the new three-story facility to pray alongside members of the Board of Directors, faculty and students before a special tour and breakfast event. 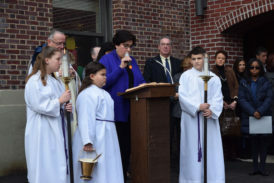 Principal Miriam Bonici and her faculty members spoke to the crowd during the blessing ceremony and offered their prayers for the school’s academic success and efforts that will help grow their Catholic identity in the community. 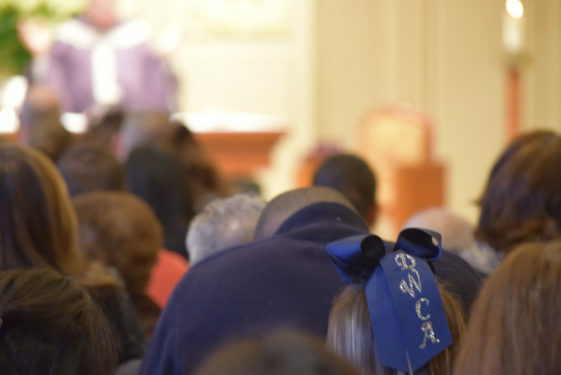 Joan Vaccari, a St. Anastasia parishioner for more than 50 years, recalls that two sons graduated from the parochial school when the Sisters of Mercy were the principals and majority of the faculty. It wasn’t until the late 1970s and throughout the 1980s that the number of religious sisters started to dwindle. “I didn’t even realize there was a new building so I’m rather shocked to see this right in front of me,” said Vaccari (left) who acknowledged the changing dynamics of the community, but also accepted the new developments. She takes a tour of the new nursery room. 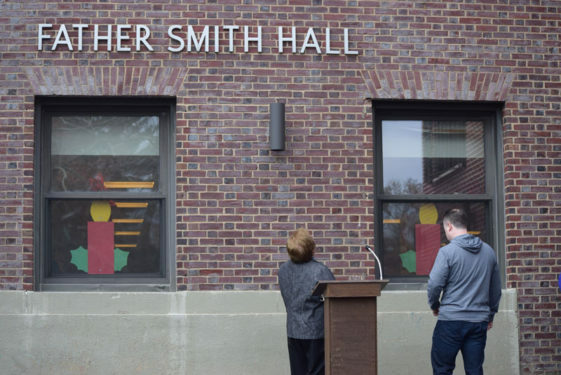 “I didn’t even realize there was a new building so I’m rather shocked to see this right in front of me,” said Vaccari who acknowledged the changing dynamics of the community, but also accepted the new developments. The new building extension stands on the corner of 245th St. and Alameda Ave. and was completed in September, after the school’s board explored the idea of expanding into unused school space. 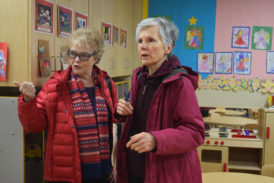 “We had to recognize where things are going with technology and arts and really make sure we give kids a well-rounded education both academically and spiritually,” said board member Robert Schirling. 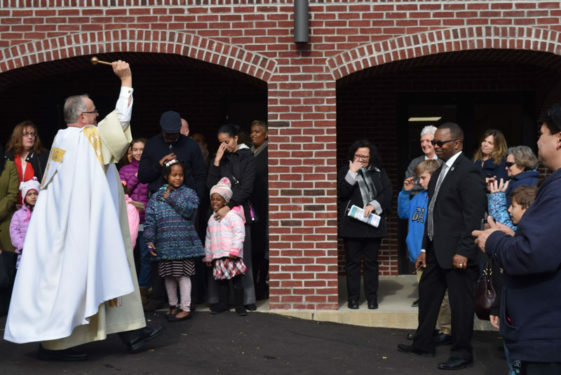 During the blessing, Schirling shared the difficulties that the board, school and parish community incurred while facilitating the building expansion. It all boiled down to one thing. 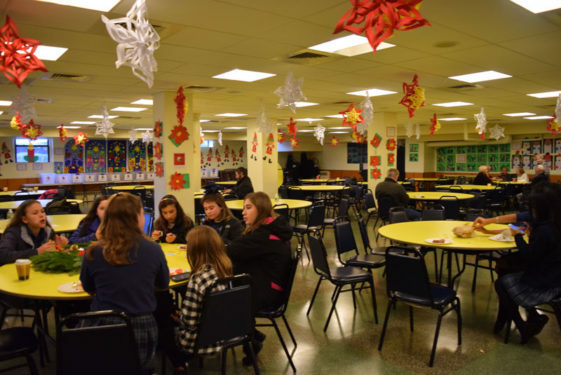 Yet the numbers speak for themselves, as Divine Wisdom Catholic Academy composed of its two campuses, Douglaston and Bayside, have enrollment numbers in the 600s combined. 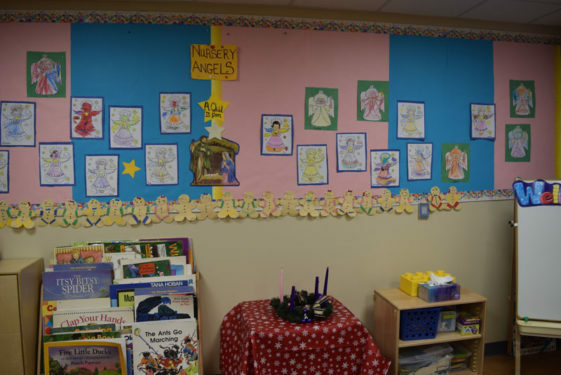 According to data from the New York State Education Department, Divine Wisdom’s numbers mirror the enrollment numbers of P.S. 221 in North Hills with more than 600 students, but dominate over the three other elementary public schools 94, 98 and Q811 in the area. On the ground floor, there’s a new nursery classroom that’s colorful and bright, equipped with an enlarged bathroom for the young students. Up on the second floor is a new 1,300 square foot music room that will be shared by student musicians as well by St. Anastasia’s choir. The space includes three long escalated wooden rows for the musicians to sit and windows along the right side for eyes to explore the Douglaston rooftops and trees. 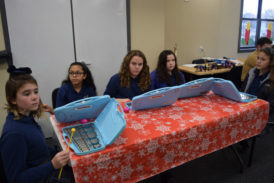 The students played Christmas tunes on their xylophones for guests Dec. 3 during an open-house tour, which included showing the visitors just how they will use their 1,300 square foot music conservatory. Eighth-grade student council president Keren Elmore was bittersweet about all the advancements taking place at the school she attended since the third grade. All the way to the top floor, one gets a glimpse of the hallways of the older part of the school, with lockers and classrooms looking like they’re in the full swing of the semester. But to the left is the new learning commons dedicated to the school’s STEM lab program, robotics and teaching planterium. 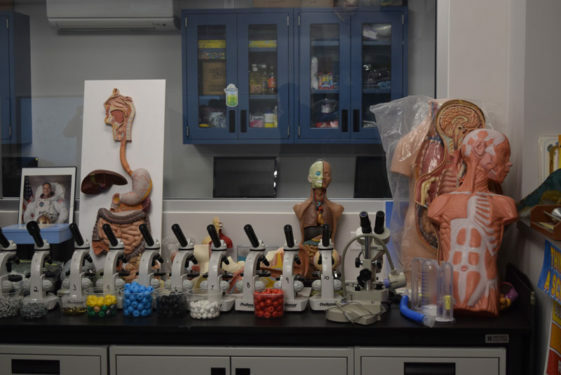 Here students gain a sense of the traditional science activities, wrapping their minds around microscopes, the idea of cells and bacteria to the more advanced classes that deal with 3D printers, computer coding and robotics. From the digital chalkboard that had young artists drawing happy faces and their squiggly names using digital markers that left no trace on their arms to small battery operated robots consisting of plastic cups with markers taped to the bottom which moved in circles to create colorful art on paper, the technology equipped in the science laboratory could compel any young mind to explore the sciences. Tools and gadgets inside the third floor science laboratory. 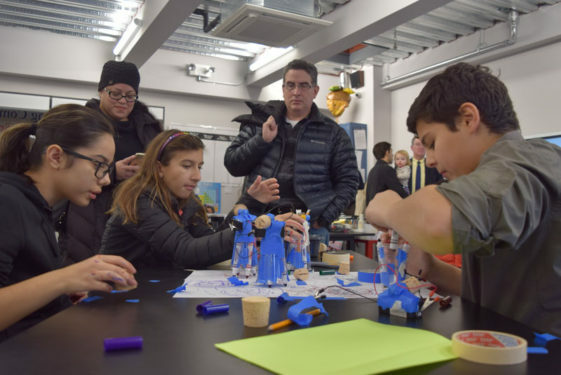 Captivated by the mini robots his two children were playing with, Benoit Jean-Noel said the upgrades to the facility were necessary in order to adapt to the climate surrounding the only private school in the district that competes with at least five other schools in the Douglaston-Little Neck area.